Watershed Views: Flooding Happens; it's only a matter of time! Flooding Happens; it's only a matter of time! It’s been less than two months since severe flooding devastated Calgary and much of southern Alberta and closer to home disrupted the lives of tens of thousands of Toronto area residents, stranding motorists and leaving homes without power. For most people who were not significantly affected, these events are already fading and becoming a distant memory. However, for those who lost loved ones, homes and their possession the loss and suffering continues as they try to return their lives to some semblance of normalcy. These catastrophic events remind us of what could happen to countless people that continue to live within floodplains throughout Canada. One thing that has always bewildered me about human behavior is that despite repeated incidents of flooding, many people continue to deny that it could happen to them. Comments like “it won’t happen here” or “it won’t happen again” are common when dealing with people who reside or work within flood prone areas. However, these events have taught us with certainty that flooding happens; it is only a matter of time. Compounding this risk is the increased number of extreme weather events that are occurring across Canada. As part of their hazard management programs, Conservation Authorities (CAs) in Ontario monitor and report on the intensity of storm events which are characterized by their return period measured in years. For example, a 100 year storm is expected on average to occur no more than once every hundred years. What CAs are actually finding is that large storm events are occurring far more frequently than the 100 year return period, sometimes within as little as three to five years. Fortunately for its residents, Ontario has been a leader in flood planning and hazard management. Conservation Authorities and the Province apply a multi-faceted approach to meeting the challenge of flood events. They rely on structural measures (dams, dykes, and conveyance channels) which keep water away from people, as well as programs and policies (flood forecasting and warning, floodplain mapping and regulations, and flood relief programs) to keep people away from water. While much has been accomplished there is a growing concern amongst Conservation Authorities that our ability to maintain and improve on this level of management and protection is threatened. Even though the documented frequency of flooding events is increasing the investment in natural hazard structures, tools, and programs are at an all time low. Over the last decade Conservation Authorities have seen their funding to maintain flood management programs decreased by more than 80%. Conservation Authorities are convinced that if this trend of insufficient funding continues it will eventually compromise their ability to protect lives and property during flood events. We cannot let this happen. We’re just hearing about the costs of these events. Alberta’s Premier reports that Calgary flood damages are estimated at $8 billion. The Insurance Bureau of Canada estimates Toronto flood damages at $850 million. How often can we afford this? Some significant rethinking and reinvestment is required by all levels of government to ensure that flood management tools are updated and infrastructure is improved to meet our obligation to protect people and property. Updated floodplain mapping, maintenance to flood control structures, and developing improved emergency management systems is essential. 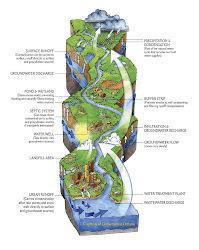 The advantages of this approach can be further leveraged with complementary practices such as stormwater management, green infrastructure, and watershed stewardship initiatives which also contribute significantly to building local watershed resilience, enabling Ontario communities to adapt more effectively to increasing flooding challenges. Now is the time to pay some serious attention to what has been happening and to remember that floods happen; it’s only a matter of time.